Rollin' down the river with Proud Mary and her krazy krewe! : It's the most wonderful time of the YEAR! Have I mentioned how much I love Christmas? I'm so excited that the stores are decked out in sparkly tinsel while blaring my favorite holiday tunes. Noah is totally into Christmas and because of that I want to jam pack every weekend with holiday events. This past Friday my friend Jade sent me a text message asking if Noah and I wanted to join her at a local Starbucks for pastries, hot chocolate and for elves to read to the kiddos. Well, that was a no brainier since I love Starbucks and ELVES? I'm so down. I dressed Noah in a holiday shirt that looks like an elf and off we went. While driving there I kept on telling Noah about the elves and that they work with Jingle, our elf on the shelf. He was pretty excited. I was excited for the elves...and also for some Starbucks. Once we got there they had a circle formed with kiddos all decked out in their PJs,I didn't get the memo about wearing pajamas. It didn't matter to Noah, he was just happy to be there. Jade and Baby Gabe were there and Gabe was on the run! Poor Jade! I remember that age when Noah just wanted to go, go , GO! The story telling was very cute and Noah enjoyed his donut. However, he HATED his hot chocolate. He took one sip and started spitting it out! Thankfully I was able to catch it before it stained that cute elf shirt I described earlier. All in all, Noah had a great time and really enjoyed story time with the elves. Noah loved the sing along parts of story time. On Saturday we went to Cabrini for Christmas on the Bayou. The weather was actually perfect! In 2008 it was SO hot we were in shorts, so it was great to have a Christmas chill in the air and not be sweating. It was great to be back at Cabrini and see all the teachers and everything. Noah really enjoyed seeing Santa. 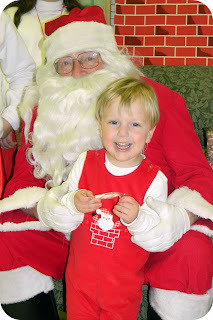 Once it was our turn to see Santa, he ran straight to Santa and started hugging him and posing for his pictures. It was really adorable! Another highlight of the night to Noah was seeing his buddy Alton and eating the yummy cookies. We had a very fun weekend full of holiday fun. Noah had a blast and loves everything about the holidays, I can't wait to take him to Breakfast with Santa on Sunday. Stay tuned!